Two explosions fired in rapid succession at the finish line of the Boston Marathon Monday afternoon around 2:45 p.m., seriously injuring at least dozens of people and killing two. 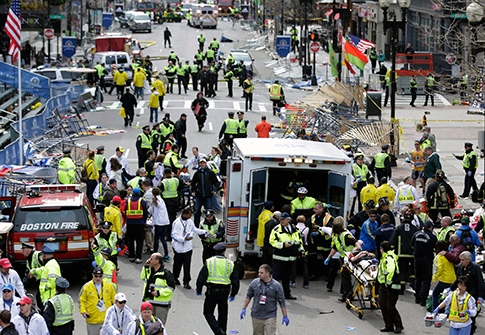 Boston Police have confirmed that 23 are injured and two are dead. The Boston Globe reported at 4:45 that their account of the toll has risen to two dead and 64 wounded in Boston; amputations and other serious injuries have been reported. The Boston Police Department said Monday at 5:22 p.m. that a third incident at the John F. Kennedy Library at Harvard University appears to be fire-related. Boston authorities also emphasized at a Thursday press conference that people should stay inside. Authorities have provided 617-635-4500 for people trying to locate family members. Any tips or information should be directed to 1-800-494-TIPS. Google Person Finder has also been activated. A spokesperson for the Boston Police Department said at 5:17 p.m. that no arrests have been made. Boston Marathon officials said in a statement posted to the official Facebook and Twitter accounts that the explosions were caused by bombs. Law enforcement officials have not confirmed that the explosions were caused by bombs. "There were two bombs that exploded near the finish line in today's Boston Marathon," the statement reads. "We are working with law enforcement to understand what exactly has happened." In Washington, D.C., the Secret Service has locked down the area surrounding the White House. New York officials have also stepped up security at landmarks and hotels, officials said. Police have warned people in the area to avoid trash cans, and have called all off-duty officers to action. Police detonated a third, controlled explosion Monday afternoon. The Washington Free Beacon will update this post as more information becomes available. This entry was posted in Politics and tagged Boston Marathon Bombings. Bookmark the permalink.